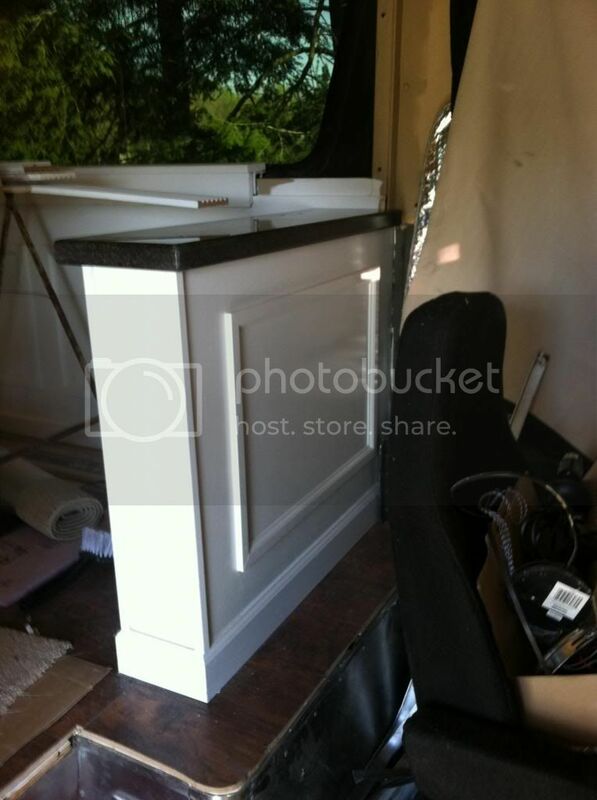 Cabinets! I bought brand new Maple factory cabinets and took a saw to them to cut out the top back corner to fit my angled wall corners. There is 5' of base cabinets under the cardboard and the wall cabinets that hang down farthest are also 5' wide. 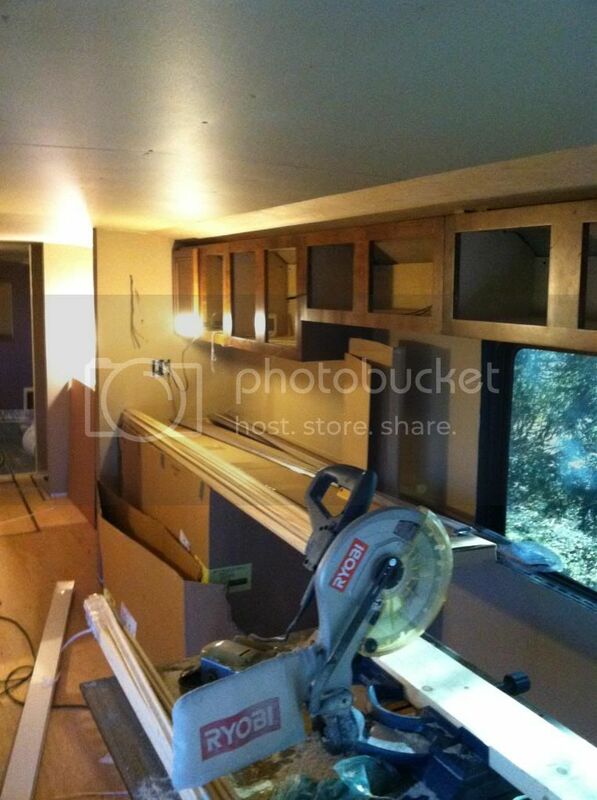 The shorter cabinets are 12"h and continue 11ft to the back of the driver's seat. Having seen how badly things can get skinned up when you're working on something else I decided to cover the base and vanity cabinets with cardboard. They stayed covered for many weeks. Last edited by Boone on Sat Apr 20, 2013 11:19 pm, edited 1 time in total. 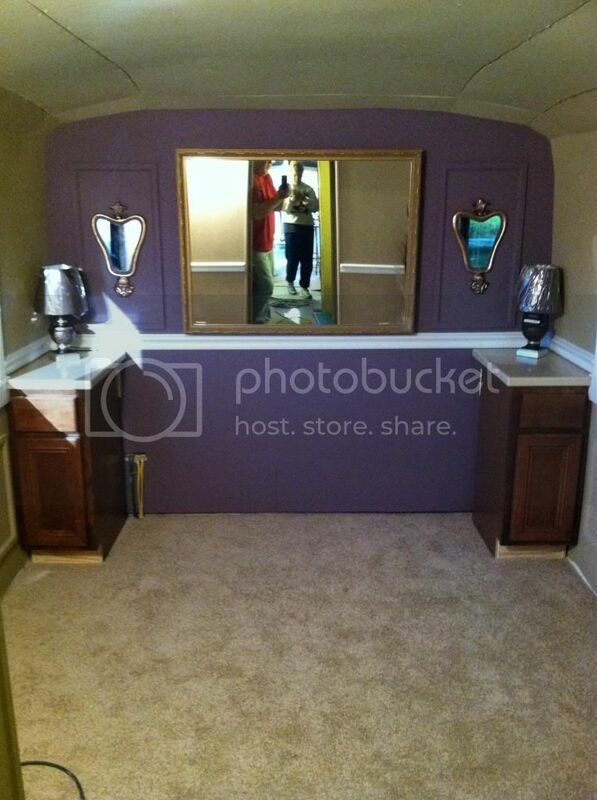 Somewhere along the line I decided that wainscoting might make things look better. I went to the local builder's supply and they had a 1 1/4w x 1/2" thick molding they called a screen door stop for about 30 cents a foot. It seemed to be about the size I wanted so I started cutting and used a 2' framing square as the jig to make the corners right. I decided that 3" between them seemed about right and I allowed for base and chair rail to be applied. At first I painted them the same color as the walls but didn't like the look so I googled "wainscoting" and saw that almost everyone does it white! That was totally not in the original plan. We had started picking colors from a tile sample that had several shades of brown that we planned to use. I decided to paint one wall white and let my wife decide. After painting the wall it looked like that side of the bus was 2ft wider than the other side. We agreed that the white had to stay so we tossed the tile sample and kept going! Since everything had started looking so "housey" I decided that the original Eagle windows would look good with some framing done so I designed what I wanted and had my Bro-in-law help me for a day or two. The framing looks like a house but the 2 front and 2 back windows still open for emergencies. Just grab the window sill, pull it up and push out! We kept the original window emergency pulls in place and mounted the sills to the top and front of them with screws. Everybody who stops by comments about how they like the windows. Nobody has ever noticed that they are designed to open. Somewhere along the line I decided to add these little half walls on each side. They are made of 2 x 6's glued and bolted to the floor and wall. Of course they got trim on both sides and a friend of mine made some Corian caps out of the same material as the kitchen countertops. We did laminate flooring in the front and the bathroom. The bedroom got carpet. I had put down a layer of luan to make the floor level and keep from taking up the metal rail where the seats mounted. 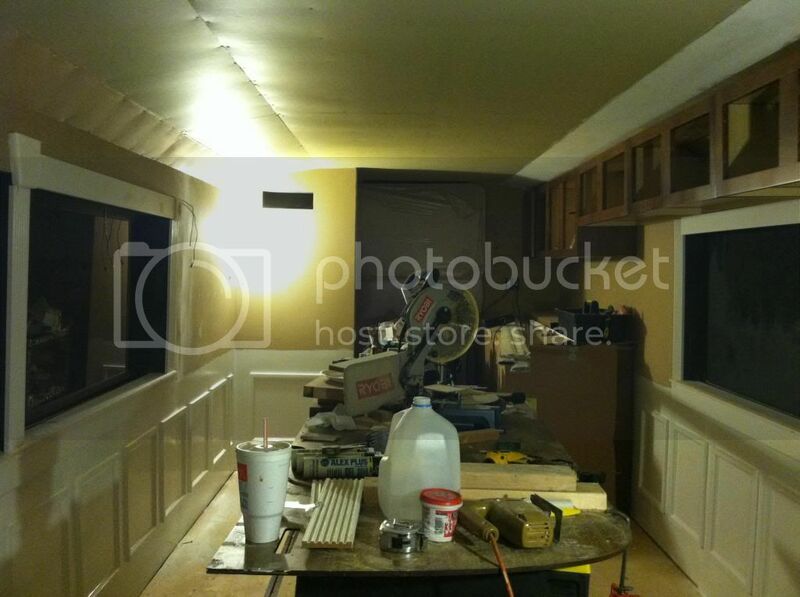 I also put a layer on top of the hatches and went right over them with laminate. While installing I discovered that I could cut the tongue edge off of a piece and you couldn't tell it so I cut the tongue edge off of a strip so I can take up a few pieces in the middle of the floor to access the hatches. The cardboard is off and the Corian is on! 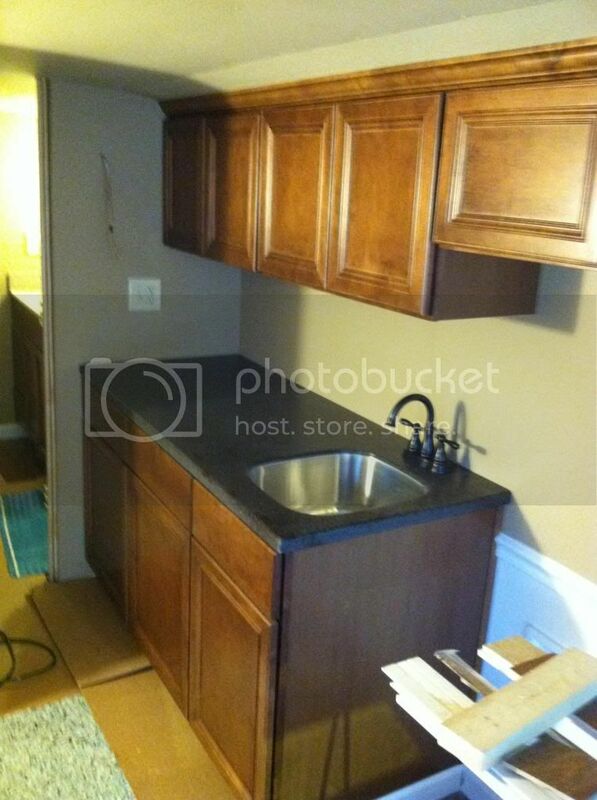 The undermount sink is trick! My friend who did the Corian said he looked everywhere and couldn't find a sink that was the size I wanted for a decent price. He took a regular double bowl undermount sink and cut it in half! 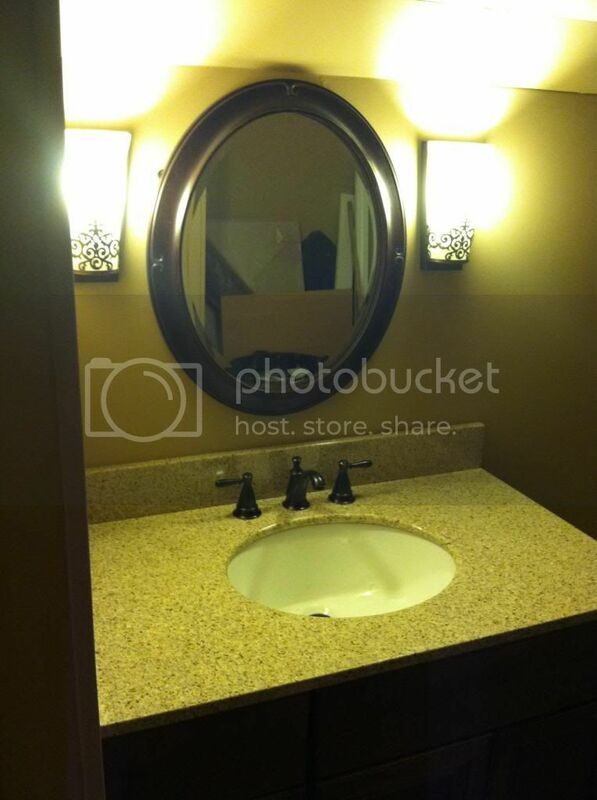 instead of paying $150 for a small sink he ended up with 2 sinks for under $100. If you are near Chattanooga he is the best! I sent him my measurements and picked the tops up and installed them myself. They all fit perfectly. The only granite in the bus. I couldn't pass this up when the kitchen dealer told me he would take $100 for the top with bowl and splashes. We picked up the lights at Lowe's and the mirror at Big Lots. 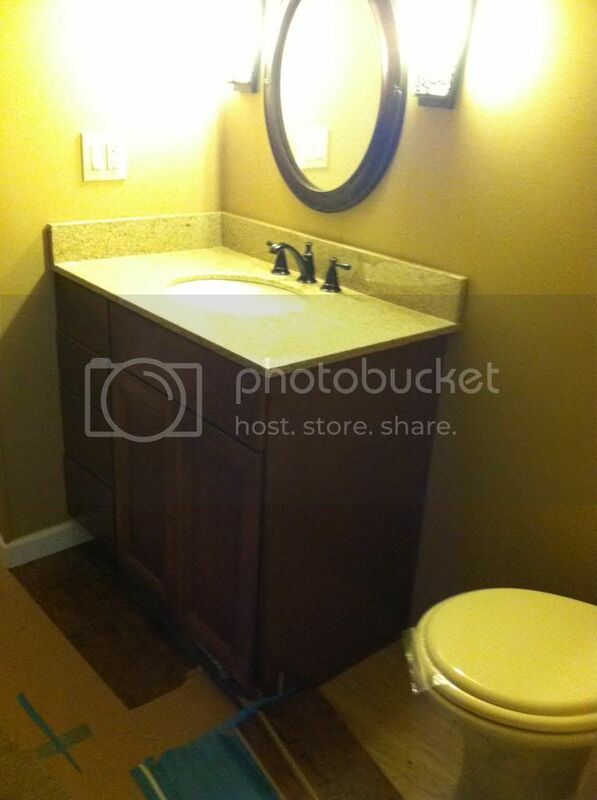 Yes, the commode is sitting at an angle. By backing it into the corner we gained several inches of space when sitting on it and it is more out of the way of the door when it opens. Sweetie suggested we angle it and you never know until you try. It worked! She has a good eye. She found the mirror months after buying the lights. The detail matches exactly. I was impressed! All we need is a bed! Since the hatches might have to come up in the future we decided to make everything removable. The bed will be a simple frame from Sam's with a 2-piece box foundation and a mattress that we already have. If it ever has to be removed the Corian is mounted with velcro and the night stands are held in place by 2 screws each. Pull out the bed and carpet and you can remove all the hatches. It would take less than 30 minutes to remove everything. The mirror is one we already had and it fit the opening behind it perfectly. I used some massive ball bearing hinges on the right side and mounted the mirror to some heavy plywood backing and framing so nothing sags. It weighs a bunch but swings open for access to the electrical and breakers. We are looking at a vinyl 2' x 4' ceiling tile that glues up and looks like a tin ceiling. It comes in several colors but we are looking at a matte white in several patterns. We decided to save the ceiling and the entrance steps until after the rest of the interior is done since they can both be done as "projects". We didn't add a whole lot of weight as we built and our furniture won't add much so I have decided to do tile on my front steps and maybe some glass tiles on the backsplash in the kitchen. I haven't shown the shower area across from the commode yet but it gets tile also...another project soon to come. The downstairs gets my attention next. Plumbing connections to finish, ac to hook up, a generator to sit in place and after that we can actually start using it and do those"projects" between trips. We plan to take our first trip in June whether we are finished or not. The bus has come a long way since you started. It is lookin real good. The one question I have is did you put insulation in the walls below the windows. In all the pic's you posted I didn't see any in that area. Dan, thanks for posting great documentation about your Eagle project. You are using some construction techniques that are slightly different from the "norm" - whatever that is. The great thing is that you give us your thoughts for the methods that make them seem very logical. What a great job of documenting your conversion! Many people will benefit from your ideas and explanations. and the only ones that count are yours and the Mrs. If Momma ain't happy..........!